It’s the most wonderful time of the year. And I’m not talking about whatever winter holiday you celebrate. I’m talking about the World Junior Hockey Championship, which has been a part of my family’s holiday tradition for over half my life now. It’s probably been in your family’s tradition for longer if you’re reading this, but I have lived my entire life south of the border, and the tournament was first televised in the States in 2007, on a Dish Network pay-per-view channel. I luckily enough got that channel, and was hooked from Day 1. Being an American, I gravitated toward the country of my birth when deciding who to root for. I had watched many of the US National Team members play for and against my favorite college team, the University of Minnesota, and had recognized a few more of the names from the NHL Draft. The World Junior alums quickly became my favorite players when they reached the NHL, and it wasn’t long before I started to pay attention to the evaluation process as well. By this point, I spend way too much time watching, writing about, and discussing the American prospects eligible for the tournament. I came into this roster announcement buildup with a great deal of skepticism, and maybe I shouldn’t have. Surely USA Hockey had learned from the disaster that was the World Cup of Hockey, or from their frequent omissions of talented scorers every year in favor of grinders, or undersized, undrafted “energy” guys. But USA Hockey had never put together a “plug in the 23 best players and sort the lineup from there” kind of roster before, and I didn’t think management was ready to finally get rid of Herb Brooks’s outdated methods. As Americans, we all like to glorify the gold medal-winning teams, but they had their share of players who shouldn’t have been there, just in 2010 Canada was missing too many top players and in 2013 goaltending saved our bacon. But this year, watching the roster announcement on television for the first time ever, something feels different. Maybe this will be the team that learned talent alone can win you a short tournament. Looking at the roster, this is what I and many USA Hockey fans have been calling for since 2011, and I have to congratulate Jim Johannson, Bob Motzko, and Gavin Regan for finally putting the US in the best possible position to win the whole thing. Is it a perfect roster? No, absolutely not. But between injuries and players NHL teams simply wouldn’t release, this is the best roster the US could put forward, and no matter what color medal, if any, Team USA wins at the World Juniors, I can be satisfied with the way the team was put together. With one defensive cut and three forward cuts to be made, here is what the team looks like. The US has put together a string of good goaltending performances at the World Juniors recently, with John Gibson, Jon Gillies, Thatcher Demko, and Alex Nedeljkovic being Team USA’s four most recent starters. Gibson and Nedeljkovic allowed the Americans to go further into the tournament than they deserved. Goaltending is going to be more important than usual this year, with the lack of defensive depth on the team. The US brought three goalies who are capable of starting at this tournament, but one has a clear leg up on the other two as camp gets underway. Tyler Parsons, London Knights (CGY): Parsons may not be the best of the three goalies five to ten years down the line, but he comes into camp as the starter, and he deserves it. The Chesterfield, Mich. native was perhaps the most underrated member of the Knights’ American-heavy lineup last year. Parsons posted a .921 save percentage during the regular season and a .925 during the OHL playoffs as London took home the Memorial Cup. He then had a great showing at the Summer Showcase, starting the game against Canada and making 35 saves in a 5-1 win. He missed a little over a month with a leg injury earlier in the season, but hasn’t missed a beat since returning; he’s second in the OHL with a .920 save percentage in 13 games. Jake Oettinger, Boston University (2017): I’m one of the biggest Oettinger fans in the world, and I have been for about four years now. He has been one of the youngest players at every level he’s been at, but has also been one of the best goalies at every level he’s played. The only 2017 first-time Draft-eligible player on this roster, Oettinger spent two years with the National Team Development Program and had the program’s best two-year career since the team moved from the NAHL to the USHL in 2009. His NTDP career save percentage was .911, tied with John Gibson for eighth all-time. The Lakeville, Minn. native took his talents to Boston University this year as part of their all-time great recruiting class, and has already established himself as one of the country’s top goalies with a .930 save percentage, which is eighth in the nation. He is on track to be the US’s starter in 2018, and should be the first goalie off the board in the 2017 Draft. Joseph Woll, Boston College (TOR): You can’t talk about Jake Oettinger without mentioning Woll. NTDP goaltending has historically had a mixed track record, but the two 1998s proved to be the program’s best tandem in its 20-year history. Woll, originally from Dardenne Prairie, Mo., had a rough go of it in his under-17 season, but found his rhythm in year two, improving his save percentage to .918. Originally a Harvard commit, Woll ended up with the Eagles and, with the early departure of Thatcher Demko, has been the starter from day one. Woll has handled the transition to the college game quite well, and has a .918 save percentage through 15 games. He’s currently a little bit behind Oettinger for the backup job, but will still make the World Junior team and gain valuable experience for next year. If there is going to be a downfall of this team come tournament time, it’s that there is no defensive depth. Not all of this is USA Hockey’s fault, mind you. Noah Hanifin and Zach Werenski will be on NHL rosters for the next 15-20 years and have better things to do than play at another World Juniors. American-trained dual citizens Jakob Chychrun and Cal Foote, neither of whom are playing at this tournament, have declared their hockey allegiance to Canada. I would have preferred to see Luke Martin here, but the fact remains that there are only three defensemen on the preliminary roster who could crack a different Big Five blueline. Which is not exactly new to the US. Last year’s team was overly reliant on the pairing of Werenski and Brandon Carlo, both of whom played close to 30 minutes a game. But it will get better in 2018. Ryan Lindgren, University of Minnesota (BOS): Lindgren fits the role of “shutdown guy” better than anyone on this roster and most players in this tournament. A highly-touted prospect since his bantam days, Lindgren captained the NTDP for both his under-17 and under-18 seasons, and showed some of his offensive prowess during the World Under-18s in Grand Forks this past April. The Lakeville, Minn.-bred left-shot returned home for college and has done pretty well for the most part on the defensive side. As conference play is starting up in the Big Ten, I expect Lindgren to get more comfortable on the offensive side; he’s not afraid to jump in on the rush or drive to the net. He will undoubtedly be a top-four defenseman on this team, and one of the key pieces in the 2018 lineup. Jack Ahcan, St. Cloud State University: Every year, there’s a surprising name from the Summer Showcase that makes its way onto the final roster. Usually that player is undrafted, shorter than the average player at his position, and was taken to fill a specific role. Ahcan does fit the former two categories, but he’s here because he’s one of the eight best American defensemen available. The 5’8″ native of Savage, Minn. was named the USHL’s Defenseman of the Year in 2015–16, and has emerged as one of the best freshman defenseman in all of college hockey playing for Bob Motzko’s Huskies. With 12 points in 13 games, Ahcan is certainly not struggling with offensive production. He projects more as a depth defenseman on this team, but he might be a name to watch when he gets closer to NHL signing age. Caleb Jones, Portland Winterhawks (EDM): Jones has some family ties to this event; his older brother Seth famously guaranteed a victory before the 2013 tournament, which the team followed through on. The younger Jones, raised in Frisco, Texas, is not as good as the current Blue Jacket defenseman, who was in the NHL at age 19, but he’s a good two-way player and solid puck-mover. Although the Oilers did not deem him ready for professional action this season, Jones has handled his second season in Portland pretty well, with 25 points in 28 games on the year, and has improved his defensive play. He deserves to have a top-four role on this Team USA, and Bob Motzko is going to need him to play some big minutes to help alleviate the pressure off the other big names. Chad Krys, Boston University (CHI): Krys’s NHL stock was actually higher coming into last year’s tournament than it is going into this year’s. But he has the advantage of being a returner, and a three-time IIHF medalist, which no one else on the team can lay claim to. Krys hasn’t had the same offensive production that he had with the NTDP in his first 14 games with the Terriers, but coach David Quinn has trusted him with eating minutes––the Ridgefield, Conn. native has played much of the season on the team’s first pairing. The natural chemistry with McAvoy and the lack of a clear #1 on the left side could mean that Krys sees first-pairing minutes in Toronto, but I think it’s a safer bet that he has more of a shutdown role and a good deal of special-teams time. Casey Fitzgerald, Boston College (BUF): Fun fact: should he make the team, Fitzgerald will be the fifth member of his family to play at the World Juniors (father Tom Fitzgerald, cousins Keith Tkachuk, Jimmy Hayes, Matthew Tkachuk). He almost made last year’s team, and in hindsight I think he probably should have been on the final roster. Fitzgerald seemed to take being left off the roster personally, as he really stepped it up down the stretch for the Eagles during their run to the Frozen Four. He ended his freshman season with 27 points and parlayed that into an early draft selection in his second year of eligibility. This year, with all the departures BC had after last season, Fitzgerald, raised in North Reading, Mass., has not only looked comfortable on the team’s first pairing, he’s thrived. He’ll be behind Charlie McAvoy and Adam Fox on this team, but he can handle an expanded role if Bob Motzko needs him to. Adam Fox, Harvard University (CGY): Fox is without question my favorite player on the roster. The 5’10” right-shot was far and away the NTDP’s best defenseman last season, setting a single-season program record for points from the back end with 59. His best performance came at the World Under-18s, where he put up nine points and was named the tournament’s top defenseman. Fox, from Jericho, N.Y., currently paces all freshman blueliners with 16 points, despite the Ivy League schools starting their season a month later than everyone else. His 1.45 point-per-game pace is third among freshman, regardless of position, in the entire country. Fox should be on the first power-play unit, and also lead Team USA in defenseman scoring. Charlie McAvoy, Boston University (BOS): Last year, Zach Werenski did the heavy lifting on what was a fairly shallow blue line behind him. This year’s crop has a similar makeup, and it will be McAvoy tasked with the role of the “do-everything” defenseman. The BU sophomore from Long Beach, N.Y. is one of the top defensive prospects out there of any nationality, and could crack the Bruins’ roster as soon as next year. He was clearly the best American defenseman at the Summer Showcase, giving the coaches and management a taste of both his offensive and defensive capabilities. With the Terriers, he’s scored 12 points in 14 games thus far, and has proven he can handle the big minutes that he will have to play in Toronto. As one of just five returners on the team, McAvoy will also be tasked with a leadership role, and he is my early pick to captain Team USA. Joe Cecconi, University of Michigan (DAL): Of all the players who made it past the first cut at the Summer Showcase, Cecconi is the one who I least expected to be here, but the lack of defensive depth means he will get a chance to prove he belongs on the roster. For the record, I like Cecconi. I think he’s a good defensive player, and at 6’2″, 205, can act as the US’s physical presence should they need one. Originally from Youngstown, N.Y., Cecconi has seen his role with the Wolverines expand in his sophomore season, and has spent some time on the team’s first pairing, though most of it has come on the second. At the end of the day, I don’t think he will make the final roster, but he definitely has a role cut out for him should he impress in the pre-tournament games. They did it. They finally did it. USA Hockey finally took its best available forward talent to an international tournament. I don’t know if it was the World Cup of Hockey or Bob Motzko or just USA Hockey getting with the times that brought this change forward, and I don’t know if it’s here to stay, but this is the best American under-20 forward corps I have seen in quite some time. It’s still not a perfect roster, though. Auston Matthews and Matthew Tkachuk are in the NHL, while Christian Fischer apparently was not released to the tournament by the Coyotes. We’ll see if Arizona decides to let Fischer go later, as he hasn’t had any NHL time yet and doesn’t look like he’s quite ready for that level. Another concern for the US is health. Max Jones, Trent Frederic, and Kailer Yamamoto are currently injured or just returning from injury, while Brock Boeser, Clayton Keller, and Logan Brown, who did make this team, are not in their team’s lineups at the moment. But top to bottom, this might just be the best group of forwards in the entire tournament, something I have never been able to say. Luke Kunin, University of Wisconsin (MIN): Center depth has long been an issue for Team USA at these events. That’s not the case this year. Kunin can play all three forward positions quite well, although he’ll likely be used on one of the wings at the World Juniors. The former NTDP captain accelerated his high school graduation to enter college a year early, and led the struggling Badgers with 19 goals last season. As a sophomore who just turned 19 on December 4, the Chesterfield, Mo. native wears the C for Wisconsin, and the added responsibilities have not hurt his play––he leads the team with nine goals. Kunin’s defensive game is also pretty good, and I’d expect him to see time on both the power play and penalty kill. Tanner Laczynski, Ohio State University (PHI): Laczynski had to wait until his second year of eligibility to be selected in the NHL Draft, but he’s already making teams regret passing on him 379 times. The Buckeyes, not usually known for churning out NHL talent or winning hockey games, are on a roll this year, and Laczynski is a huge reason why. The center from Shorewood, Ill. earned an invitation to the Summer Showcase after a 63-point USHL season. At the college level, he is second among all freshman in points, and his 1.47 point-per-game pace is the highest of any college player on this team. He isn’t a guarantee to make the final roster, but he fits nicely into a fourth-line center role, or possibly as the thirteenth forward with the speed he has. Patrick Harper, Boston University (NSH): Harper would be the crown jewel of most recruiting classes in the country. At BU, he was probably the sixth-best recruit coming into the season. Kind of an unknown as a late-round draft pick coming out of the New England prep school ranks, Harper started off the year with a five-goal performance in an exhibition against a CIS team and hasn’t let up from there. Against NCAA competition, Harper has scored 17 points in 14 games, which is tops on the most stacked roster in the country. His performance opened the eyes of Team USA’s coaches and management, who made the New Canaan, Conn. native the only player that wasn’t invited to the Summer Showcase who ended up on the preliminary roster. He’s not guaranteed to be in the lineup on Boxing Day, but at the very least, he’s gaining valuable experience for next year. Jordan Greenway, Boston University (MIN): Greenway is probably the 1997-born player who has taken the biggest leap in his game from last season to this one. I didn’t expect him to make this team six months ago, but after a dominant performance at the Summer Showcase and the year he’s having with the Terriers, it’s clear he’s going to get a lot of action at the World Juniors. The 6’5″, 230 pound left wing from Potsdam, N.Y. can play on any line, although the team’s lack of natural left wingers means Greenway would ideally fit in a top-6 role. I’m not sure if Bob Motzko is comfortable with him in that spot, but Greenway does have 13 points in 13 games, and has been quite effective in the power forward role at both even-strength and on the power play. Joey Anderson, University of Minnesota Duluth (NJ): Anderson was cut at the halfway point of the Summer Showcase, and rightfully so, but he’s had such a good start to his college career that it made him impossible for the coaching staff to overlook when finalizing the roster. Anderson, from Roseville, Minn., was the third member of the NTDP’s top line last year, on the right side of Kieffer Bellows and Clayton Keller. 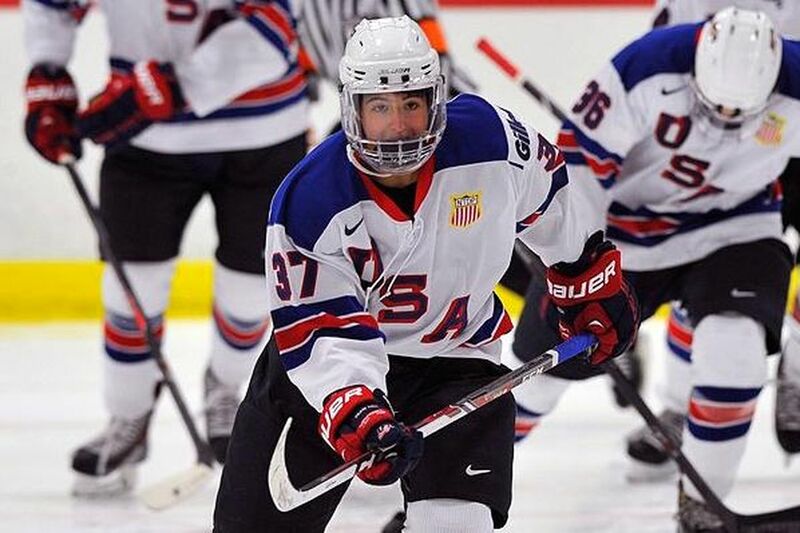 More of a power forward and netfront presence with the NTDP, Anderson has settled into a playmaker role in his first season with the Bulldogs, and has 15 points playing on the top line of the #1-ranked team in the nation. Right wing is the deepest position on the roster, so I don’t know exactly where Anderson slots in, but I certainly believe he should be on the team when it’s all said and done. Erik Foley, Providence College (WPG): Foley is one of my favorite prospects, and after his great performances in the past two Summer Showcases, I’m really glad he’s finally getting a crack at the World Juniors. The Mansfield, Mass. native had a slow start to his freshman season, but picked up the pace later in the year, and has continued his offensive production through the first half of his freshman campaign, with 14 points in as many games. Foley, who plays much bigger than his size would indicate, isn’t a sure bet to make the team, and will be in a lower-line capacity should he do well at the pre-tournament camp, but I like him in the thirteenth forward spot, as a versatile left winger who can act as a power forward, agitator, or an offensive threat. Brock Boeser, University of North Dakota (VAN): When healthy, Boeser might just be the best player in college hockey, and he’s only 19 years old. In his freshman year, he scored 27 goals and 60 points as the Fighting Hawks took home their first national championship in sixteen years, with the Burnsville, Minn. native providing a goal and two assists in the final game. Unfortunately, at last year’s World Juniors, I felt he wasn’t used properly, with the third-line right wing role limiting his offensive opportunities, and he struggled. Boeser passed up the opportunity to turn pro after one season to try and win another national title, and has 16 points in 13 games thus far, although he has missed the last three of North Dakota’s contests with an unknown injury. He is expected to be healthy for the tournament, and we should see him on the first line come Boxing Day. Jeremy Bracco, Kitchener Rangers (TOR): Some people, mostly the ones in my Twitter mentions, cried politics when Bracco, who almost cracked the 2015 team as a 17-year-old, wasn’t even given a chance to make the team in 2016. I didn’t find it to be that egregious of a snub, but Bracco sure seemed to, so this year he made sure USA Hockey had no excuse to not include him on the roster. Bracco, of Freeport, N.Y., was eligible to play in the AHL this year, but he remains without an NHL contract, so he returned to Kitchener for his second season and has proceeded to make the rest of the OHL cower in fear every time they place against the Rangers. The 5’10”, 190-pound right winger has 50 points this year, which is third in the league, and has scored a point in all 25 games he has played in this season. Bracco has played well for Team USA in the past, and I can see him becoming a household name to more than just Leaf fans at this tournament. Colin White, Boston College (OTT): The overtime hero in the gold medal game at the 2015 World Under-18s, White missed the Summer Showcase with an injury, but his seven points in seven games at last year’s World Juniors meant that the coaches didn’t need a summer camp to see how he meshed with the other players. White put up 19 goals and 43 points in his freshman season as the Eagles made the Frozen Four, and was given a chance to turn pro and try to make the Senators’ lineup this year, but he felt he needed another year of college hockey, and decided to stay at BC. An alternate captain at the 2016 tournament, the Hanover, Mass. native has 10 goals and 17 points, and has played the entire season at center after spending his freshman year alternating between center and wing. Depending on the status of Clayton Keller, White may be the US’s #1 guy up the middle at the World Juniors. Clayton Keller, Boston University (ARI): My favorite thing about watching the World Juniors is seeing the future stars of the NHL in action. After getting to watch Jack Eichel and Auston Matthews wear the stars and stripes during the last three events, I don’t think we have anyone quite at that level on this team, but the safest bet if you’re looking for a future star is Keller. At just 5’10” and 175 pounds, Keller’s two NTDP seasons were more productive than anyone who had ever passed through the program, including Phil Kessel and Patrick Kane. The pride of Swansea, Ill. had 107 points last year to bring his two-year total to 189, nine above Kessel’s mark, and was the last cut from the World Junior team. Keller is just coming back from a leg injury that cost him a month of action, but had nine points in seven games before his injury. He will be given every opportunity to be Team USA’s #1 center, and he still has a year of eligibility remaining. Troy Terry, University of Denver (ANA): If you asked me in August if I thought Terry would make even the preliminary roster for the World Juniors, I’d have given you a flat-out no. By December, though, I felt he had done more than enough to warrant lower-line consideration, and so did USA Hockey. A fourth-liner with the NTDP, the Highlands Ranch, Colo. native earned his spot centering the Pioneers’ top line following the early departures of Danton Heinen and Trevor Moore to the pros. Terry is currently tied for Denver’s goal lead with eight, and despite being the youngest player on the team, is already one of the best pro prospects for the second-ranked school in the country. I’m not sure if he’ll be on the team when the final cuts are made, but he’ll be given a fair chance to impress the coaching staff and prove that he should be there. Logan Brown, Windsor Spitfires (OTT): Soccer fans are used to these dual citizen battles, but because of IIHF eligibility requirements, these tugs-of-war are not nearly as prevalent in hockey. However, Brown, originally from Chesterfield, Mo., moved with his family to Canada as a teenager and thus was eligible for both countries. He initially played for Canada in non-IIHF sanctioned events, but switched to the country of his birth this past April for the World Under-18s, which tied him to the United States forever. That was a really big get for USA Hockey; 6’6″, 214-pound centers who average over a point per game in their draft season do not grow on trees. With the Spitfires scheduled to host the Memorial Cup in 2017, they’ve got a pretty stacked roster, and Brown is one of their key pieces as their top-line center. He had 21 points in 15 games before a wrist injury sidelined him in November, but he is expected to be back before the World Juniors start. Kieffer Bellows, Boston University (NYI): Bellows hasn’t had the greatest start to his college career, but he has a good enough track record with USA Hockey and more than enough talent to gain inclusion on this team. As a 16-year-old, Bellows had a 33-goal Rookie of the Year season for USHL Sioux Falls, and led them to the Clark Cup championship. An Edina, Minn., native, he only spent one year with the NTDP, but made the most of it, finding instant chemistry with Clayton Keller and recording just the fifth 50-goal season in program history. He also was named to the preliminary roster for last year’s World Juniors, although he did not survive the first cut. Bellows’s spot on this year’s squad isn’t set in stone, but he does have the advantage of being a high-profile natural left winger on a team that isn’t especially deep at that position. Alex DeBrincat, Erie Otters (CHI): You might remember DeBrincat from his spear of Canadian Travis Konecny in the Boxing Day game last year, or from the awkward fall in the Sweden game that effectively ended his tournament. But when I think of DeBrincat, I think of the 5’7″ winger from Farmington Hills, Mich. that has scored 51 goals in each of the past two seasons, being able to prove that he wasn’t just a product of Connor McDavid by repeating his feat with different linemates in 2015–16. In his third and final OHL season, DeBrincat is on track to lead the league in goals for the first time, with his 29 tallies six more than the nearest competitor. Averaging more than a goal per game earned DeBrincat an entry-level deal with the Blackhawks, which he signed in early November. He’s a safe bet to get big minutes at the tournament, but a sinister part of me likes him in an agitator role, knowing that an underrated part of his game is getting under people’s skin. Jack Roslovic, Manitoba Moose (WPG): When Roslovic signed a pro contract after just one year at Miami, I thought he was making a mistake. Surely he had more to learn at the college level. But he has certainly proven me wrong so far this season. With rumors swirling that Roslovic would be bound for the London Knights, the Columbus, Ohio product played well enough for the Jets in the preseason that they instead allowed him to play against men this year. With Winnipeg having arguably the best prospect pool in the entire league, it’s even more impressive that the 19-year-old is leading the way for their farm club. Having played all 21 games for the Moose, Roslovic has 17 points, which is third among AHL rookies. He is capable of playing center or either wing position, and is my sleeper pick to lead the World Junior team in scoring. Tage Thompson, University of Connecticut (STL): Thompson’s rise since the 2013–14 season has been nothing short of meteoric. He went from playing under-16 hockey as a 17-year-old to a fourth-liner with the NTDP to accelerating his studies to go to college a year early to a power-play specialist in his freshman year at Connecticut to a first-round draft pick to one of Hockey East’s best goal scorers as a sophomore. Thompson, who lives in Orange, Conn., was one of the best players at the Summer Showcase, and, with half of his ten goals on the year coming on the man-advantage, is someone I expect Team USA to use on their first power play unit. The 6’5″ Thompson can play center or right wing, and is a good option for the thirteenth forward spot with his versatility. If I had to guess, this would be my final roster.